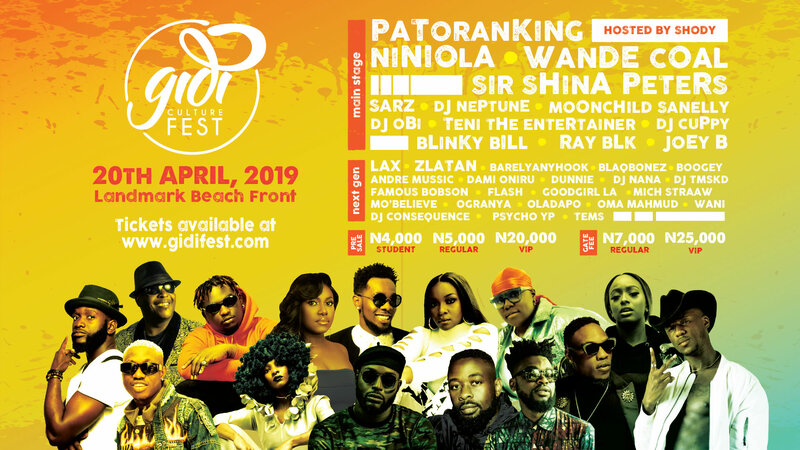 WHEN IS GIDI FEST 2019? 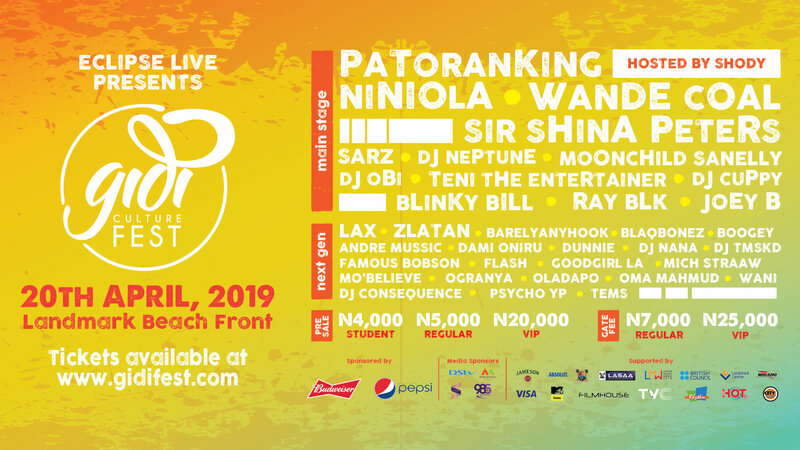 WHAT BANDS/ARTISTS ARE PLAYING AT THE 2019 GIDI FEST? The 2019 lineup will be available soon. Keep a lookout for lineup updates. See the complete 2019 lineup page HERE! WHEN WILL TICKETS FOR THE 2019 GIDI FEST GO ON SALE? Pre-sale tickets are on sale now… HERE! ARE STUDENT TICKETS ON SALE AND HOW DO I PURCHASE THEM? Pre-sale Student tickets are available in accredited Universities. List available HERE! CAN I PURCHASE GIDI FEST TICKETS AT THE EVENT? There will be a box office on event day. We will accept cash, USSD, M-Visa or credit card. WHAT IS INCLUDED IN THE VIP EXPERIENCE? HOW DO I GET TO GIDI FEST? Check out Getting Here page for information. WILL THERE BE VALIDATION AT THE GATE & WHY DO I NEED TO VALIDATE? All ticket holders will be issued a wristband on Day of the event. If the wristband is removed, you will not be issued a replacement. Re-entry will be at full price. Ticket and entry are voided if the wristband is removed. Win Big! Play to win cool prizes at the festival like 2020 tickets, VIP Upgrades, Artist Meet & Greets, and more! Yes, particularly the day event. We have several activities that are child-friendly. Children 12 years of age and under gain free admission. For more information on children activities. WILL THERE BE ATMS AT THE FESTIVAL? Yes. Please see the Venue Map for locations. Please see our Parking and Transportation page for more information. OK, SO WHAT ITEMS ARE NOT PERMITTED? Alcohol (we will provide on-site) and other beverages. ARE THERE ANY ADDITIONAL POLICIES? No unauthorized vending. Gidi Fest reserves the right to deny entry or remove from the festival anyone in violation of these policies. We love our furry friends, but we request that you please leave pets at home. IS PHOTOGRAPHIC OR RECORDING EQUIPMENT PERMITTED AT THE FESTIVAL? Hand-held still cameras are permitted. Tripods are not permitted. Audio and video recording devices are NOT permitted. DO YOU HAVE INFO, MEDICAL & FIRST AID STATION ON SITE? Of course! We make every effort to create a safe environment at the festival. To ensure this, we have security and medical staff working throughout the grounds, as well as clearly marked medical tent and an information booth located in short walking distance to the stage. If you’re experiencing any problems whatsoever, please locate a festival staff member, security guard, or police officer. If you or someone you know needs medical assistance, seek out the medical tents. You can refer to the Festival Map for exact locations of medical tent on the site. HOW CAN I GET PRESS PASS? CAN MY ARTIST PERFORM AT GIDI FEST? To stay tuned into on all the latest news from Gidi Fest, sign up for our E-list and receive important announcements and critical updates. Sign Up Today! Get up-to-the-minute updates straight from the Festival @GidiFEest and also share photos and interact with other Gidi Fest fans when you like us on Facebook, follow us on Instagram and Twitter, and watch us on YouTube.